The Expert Advisor recommended for trade on GBPUSD M5. It is based on defining micro-trends. The robot calculates the market entry/exit points based on correlation of a number of indicators. The trading volume for opening a position depends on results of previous trades. It is possible to limit the amount of risk (the AutoMM parameter). 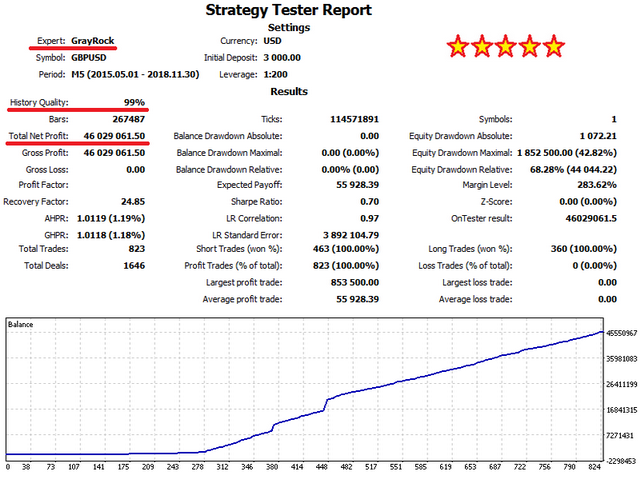 It uses an efficient trailing, which automatically adjusts the take profit and stop loss parameters to minimize losses. It is also possible to set the maximum spread, above which the EA will automatically suspend trading (the MaxSpread parameter). It also has advanced features for managing news releases. Добавлена расширенная функциональность учета рыночных новостей. Updated the algorithms for entering and exiting the market. Significantly improved the algorithms for entering and exiting the market. Added more efficient algorithms for entering and exiting the market, increased the stability of the EA.